There are a lot of “versions” of how the powder keg was lit, and it may never be possible to untangle all the complexities of “what actually happened.” But there is a key element in the narrative that I heard repeated multiple times from diverse sources with first-hand knowledge that has important implications for me: leadership failure. What follows, then, is not an attempt at history-writing, but about the implications of this narrative in which so many people (many of whom I love and respect) locate themselves. The people had been gathering on Maidan peacefully for months now. As time went on, pressure (and violence, implied or actual) was increasingly brought to bear from the side of the government. 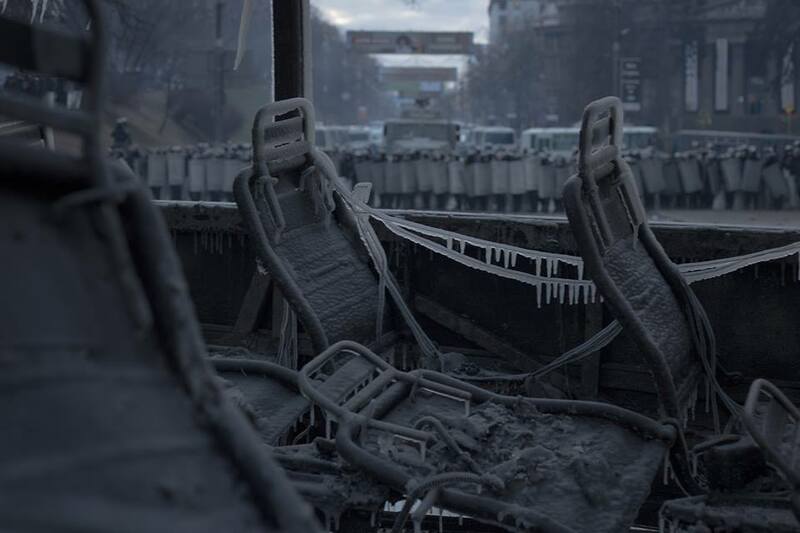 Not seeing an effective way to stop this trend, the “people” (narod) on Maidan pressed strongly, loudly for a “single leader” behind which the political strength of the people could be deployed. The leaders of the “political opposition” had formed a “loose coalition” which could attract their diverse constituency. In addition to broad appeal, this arrangement was easily the “safest” for the politicians involved. But this was no longer what the people wanted. An activist from Automaidan (well respected and seen as effective by the narod, particularly for organizing pickets of government officials’ luxurious mansions) took the stage on Maidan (which was, and remains, available to all). He read an appeal asking for the opposition to choose one leader to push the people’s demands in the political arena. It didn’t matter who, but there had a be unified leadership. The narod on Maidan loudly and enthusiastically shouted its agreement to this position. But the opposition politicians disagreed, Vitaliy Klitschko calling him a “provocateur” (a most serious accusation). 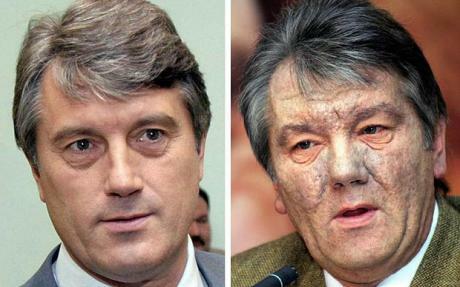 Everyone remembers what happened to Viktor Yushchenko, who was the face of the Orange Revolution of 2004 – a face which became disfigured by dioxin poisoning which many believed was done by, or at the behest of, governmental agents. They each knew that “the tallest nail will be the first to get the hammer.” They each have their own political future to pursue (whether to the benefit of the nation or themselves), each only wanting to ‘make their move’ at the most opportune time. One of the leading troika, Arseniy Yatseniuk responded from the stage to this request to name a leader, crying “The Leader is the Narod!” However, it was precisely this “narod” that was demanding courageous and active leadership. This was profoundly dispiriting to the people, who were beginning to feel that no one on either side was actually listening to them. Rada, Nov. 2004. Picture by author. So, making the best of things, this “narod” – now having been anointed with some sort of mantle of “leadership” – decided to head up to the legislature (Rada) to protest the legislative anarchy that they perceived was going on there. 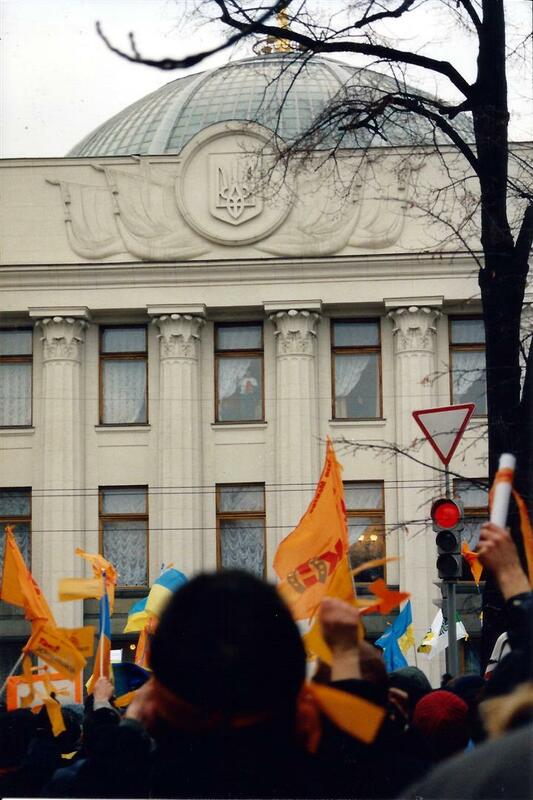 (This was a scene of many mass protests during the Orange Revolution.) However, this time the “forces” were not ready to allow such pressure being placed upon them. So, as protesters began to head up the hill the riot police (heaving heard rumors that they were heading to either the Rada or the Cabinet Ministry building to either occupy or torch them) stopped them with a massive show of force. The people were upset, and, as it “happened” there were a goodly amount of people and groups (many of whom had not been widely known until then) who were ready to engage power with power, threats with threats. “I can’t understand that I, a 22-year-old Ukrainian, could become a criminal in my own country merely for sharing information and telling the truth. Many outside the country may wonder who started the latest conflict and why it has escalated so quickly. But I can understand why people behaved this way and I can’t call them provocateurs. It is sad and wrong that they have expressed their feelings this way, but when there is no leader in the crowd to control people, they start to act as the street teaches them. I work with a Christian organization that places a strong emphasis on leadership, particularly leadership that “develops, empowers, and releases” people. Empowerment is indeed a very tricky process. Perhaps the politicians thought they were “empowering and releasing” the narod? But true empowerment, like true dialogue, cannot be scripted in advance, cannot be pursued along routes pre-designated in advance. In this case, those putting themselves forward as “leaders,” missed a huge opportunity to serve… the people, the narod, had made it clear that they truly needed a leader, and that they were ready to follow. By ignoring these demands, whether out of strategic differences or personal considerations, the “leaders,” in fact, ceased to be able to function in that capacity. Proclaiming “the narod is the leader” was not empowerment, it was a refusal to listen to and to embrace the will of the people who needed the tactical and political direction that these “leaders” could provide. In asking how things took such a violent turn when one made the turn from (peaceful) Maidan to (violent) Hrushevskogo (literally right around the corner from one another), many will employ methods of “objective” history, as well they should. 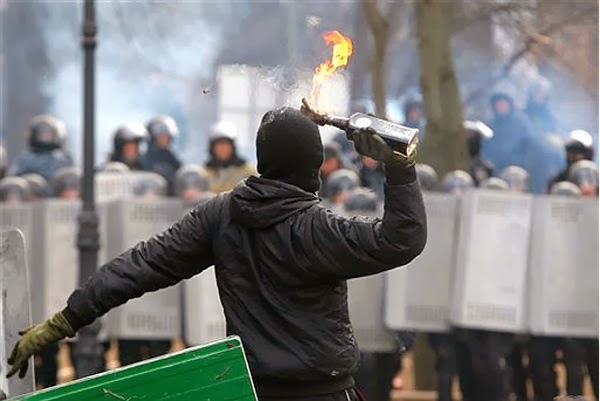 But, at a deeper level, I think there is here a great lesson for leaders – one from which I pray the Ukrainian political opposition – and all of us who strive to lead well – can learn.